I much appreciate – especially as Eric is a fellow flyer. Jarrolds. First edition 1969. 184 pages and well illustrated with photographs. Fine condition hardback book and dustjacket. Thanks to a broken leg during training, Arthur Stanley Gould Lee gained valuable additional time flying trainers before he was posted to 46 Squadron in France during World War I. In November 1917 during low level bombing and strafing attacks, he was shot down three times by ground fire. 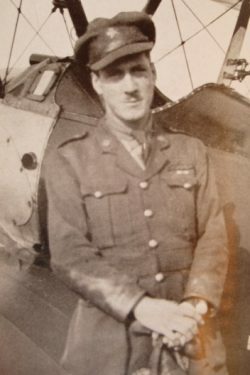 He spent eight months at the front and accumulated 222 hours of flight time in Sopwith Pups and Camels during a staggering 118 patrols; being engaged in combat 56 times and scoring 11 victories. He lived to retire from the RAF as an Air Vice-Marshal in 1946. “Author of several books on his WW1 flying experiences, this is by far his best. 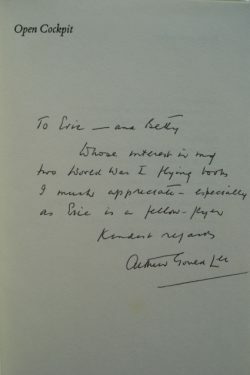 Based on descriptions written at the time, Lee puts you in the cockpit in a riveting account of life as a fighter pilot at the front. Exposed to the slipstream and to every extreme of weather, the pilot and his fragile craft were one with the element in which they flew. 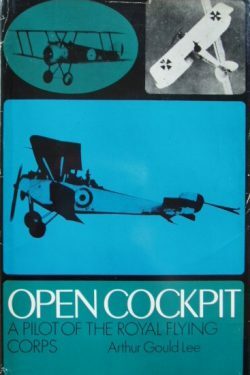 Even in combat, pilots were conscious always that they belonged only to the sky and the clouds – and it is the reflection of this awareness which gives ‘Open Cockpit’ its very special quality”. After nearly 50 years, this book was republished by Grub Street and to commemorate the 100th anniversary of the Armistice, a paperback edition was published in 2018. An excellent, scarce, signed first edition WW1 memoir.